The location was close to the harbor. The place was affordable and we had our own bathroom. The hotel is right across from the ocean. The rooms were pretty basic but have most everything you need. The staff were friendly and the price was pretty affordable. The Service was amazing! We stayed in the villa and Andy came every morning to take our orders and bring us juice and breakfast. It was fantastic. The Staff was incredible and the villa was very nice! Large and comfortable room. Wifi worked alright, but it was spotty. Bed was comfortable, and it was nice to have a mini fridge. The hotel is right on the main road, so it's within walking distance to everything. Noise from the road woke us up one night, but I think it was just a particularly loud person. Pool is mediocre and is mainly used for dive training. Nice room and really big bathroom. Good breakfast options. A/C worked really well. Wifi was pretty consistent. The island of Gili Air had been hit by a massive earthquake only a month earlier to our arrival. The place had been fixed up quite well and they had already well and truly fixed the place up. Fantastic staff that went out of their way to make us feel welcome and comfortable. The views were amazing and location was cental to everything. Great and very helpful staff. Great bungalows. Great restaurant by the sea. Short walk from harbour. The location was good on the island, however, the level on animal abuse towards the working horses should not be acceptable on the island. 7SEAS Cottages This rating is a reflection of how the property compares to the industry standard when it comes to price, facilities and services available. It's based on a self-evaluation by the property. Use this rating to help choose your stay! Featuring a restaurant, a dove center and a shop, 7SEAS Cottages offers a tropical getaway on Gili Air Island. Only a few steps from the beach, the accommodations features cottages with private terrace or balcony overlooking the nature. Free WiFi is available in all areas. 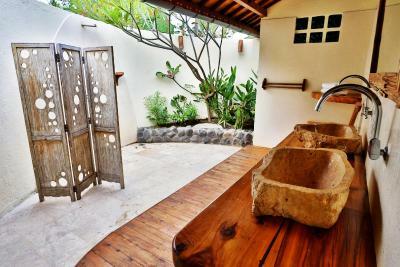 Cooled by air conditioning, rooms in 7SEAS Cottages come with private bathroom that has hot water shower and free toiletries. A mini-bar is available in every room. Guests can relax by the swimming pool which is shared with the dove center, enjoy a leisurely stroll by the beach or take a surf lesson. Diving courses and trips can also be arranged upon request. Staff can assist with luggage storage and airport pick-up arrangements. Dining options are within 5-minute walk. Gili Air Island itself is reachable by a 20-minute boat ride from Teluk Nare Harbor in Lombok, or a 3-hour boat ride from Sanur Harbor in Bali, located a 30-minute car ride from Ngurah Rai International Airport. When would you like to stay at 7SEAS Cottages? Offering more space and also located only few steps away from the beach, this air-conditioned cottage comes with a wardrobe, a personal safe, mini-bar, and a semi-open private bathroom featuring hot and cold shower with free amenities. Guests can enjoy a relaxing afternoon at the private terrace. Located about 98 feet from the beach, this spacious two-bedroom and two-story family cottage can accommodate up to 5 guests. This suite is equipped with air conditioning in each room, private bathroom with hot and cold shower with free amenities, and a private terrace. The upper floor offers views of the trees and the ocean. This spacious two-bedroom villa is surrounded by lush tropical garden and features a private outdoor swimming pool, it also offers a grand view of the sparkling ocean. This villa also comes with a separate living area, dining area, and well-equipped kitchen. Each bedroom is air-conditioned and fitted with wardrobe and an private bathroom with shower facility. Please note that the recent earthquake damaged the fresh water pipes to the island. Until the repair is done, the property will use brackish water for the swimming pool and bathrooms. This double room has air conditioning, private bathroom featuring hot shower with free amenities, mini-bar, private entrance and balcony. Daily breakfast is provided. This twin room has air conditioning, private bathroom featuring hot shower with free amenities, mini-bar, private entrance and terrace. Daily breakfast is provided. House Rules 7SEAS Cottages takes special requests – add in the next step! 7SEAS Cottages accepts these cards and reserves the right to temporarily hold an amount prior to arrival. Please note that check-in and key collection take place at: Jalan Labuhan Pantai, Gili Air 83352. Bungalow was dimly lit and wifi hardly ever worked. The pool was underwhelming but beaches on Gili Air are nice to make up for it. The pool was constantly being used by the diving groups. The WiFi worked around 20% of the time. As the bathroom is outdoors, there were a lot of leaves and needles from the trees in the shower area. Even immediately after house keeping went through the room the leaves were all still there. I guess this is to be expected with an outdoor bathroom but a good clean of the floors once a day would probably be good. There was no lock to the bathroom, but the hotel and general area felt safe enough not to worry about this. Wifi access was a little bit hit and miss. Some days it worked perfectly, other days I couldn’t connect at al! The cottages are really Near to the beach and easily accessible! The bed is comfortable and room has ample storage and a safe deposit. The bathroom is semi outdoors and has a very large shower and double basin. The staff (at reception and the restaurant) were all really helpful and attentive at all times. The bed was really hard and the coils I could feel. By the second day my hip hurt because of sleeping on my side there with the coils digging into it. The bathroom shower kind of clogged up and had no central AC so was muggy. The breakfast was not bad but the flies were everywhere all over the food and some days no one covered the food. That was gross. Flies you can't always control but covering the food you can. This side of the island is near scallywags which has a nice beach but often gets polluted by a garabage smell since the islands dump is nearby. Could explain the flies. Eating fish is like a fight with the flies. I recommend going to the North part of the island for the beach, less flies and better snorkeling, beach and sunset. The pool is really used for scuba divers, is not actually next to the cottages, small and dirty looking. Nice and comfortable room . Price worthy. Staff were lovely, breakfast curries delicious. Breakfast was ok, self service. Pool dirty and unusable Shower and taps off !! The only two issues we had were that the water did not warm up enough even though the geyser was connected and that the bed was uncomfortable. However for island living it worked out well. For gilli air, this place was great. 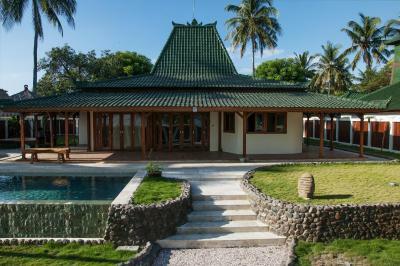 Gili air does not have much on the island especially resources therefore this property was well equipped. The location was perfect. it was a 2 min walk from the ports but also central to the beach and restaurants,and the cafes. The 7Seas cottage was located on the south east side of the island nearby the beach which you could go into the water (The west side has too much coral). The staff was very nice, and helpful. The room was a decent size with a big bathroom. Both the bedroom and washroom were clean. We had wifi, and no geckos in our room ! i always stay there when i visit gili air. it’s close to my favorite beach scallywags. great value for money. very friendly staff. clean.